Electronics such as smart phones are invented to make our lives just a little bit easier and more convenient. However, many people complain that with all the digital advances in our society, we are losing real human connections and are lacking personal interactions. 51% of Americans prefer to purchase online, but that other 49% still favor a good old-fashioned visit to a brick and mortar store. This number is largely due to the level of customer support that’s received in person versus online. When it comes to purchasing pricey, high-tech gadgets or software, customer support is needed more than ever. Customers may be unfamiliar with how the product works, how to set it up, and have many questions related to warranty and insurance. They are more likely to visit a physical store to complete their purchase just so they can receive that one-on-one, personalized attention from an expert. However, there’s no denying that e-commerce is growing at an unprecedented rate and that brick and mortar stores are trying to reinvent themselves to service online customers. This year, projections say there will be 224 million digital shoppers in the U.S. and roughly 8 out of 10 Americans consider themselves online shoppers. The U.S. is the largest tech market in the world and worth approximately $1.6 trillion For high-tech business owners who are reliant on in-person sales, now is the time to evaluate your customer support and whether you are providing the same attention to online clients that you would in store. Live chat platforms allow businesses to connect with customers instantaneously and in a one-on-one setting. Live text chat eliminates frustrating hold times for customers and the routing process of having to speak to multiple agents regarding the same issue. 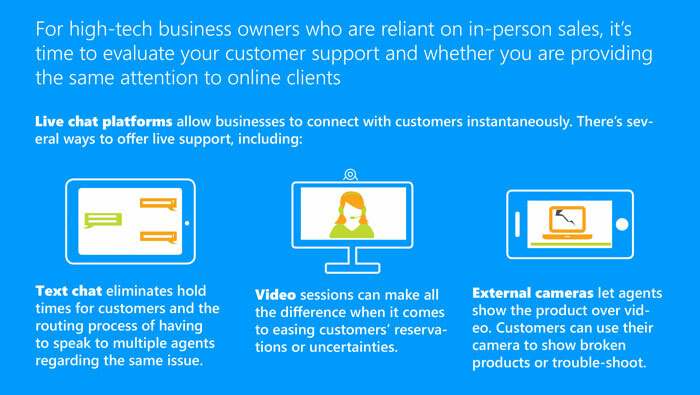 To take it a step further, businesses are also offering live video chat support to their customers. A live video engagement session is similar to an in-person store appointment where the store agent can see the customer and judge emotions through eye contact and body language. There are over 100,00 software and IT companies in the U.S. and selecting an unfamiliar software can be intimidating and require hours of research. Live video sessions can make all the difference when it comes to easing customers’ reservations or uncertainties. In fact, Vee24’s clients have seen more than a 30% reduction in sales cycle time, a 96% increase in CSAT scores and an NPS score of 80+ from assisted online sessions. Another feature of Vee24’s live chat software that is proven to drive higher NPS ratings is the mobile camera capability. Customers choose to shop for tech products in person because they need to see the product working in real-time, and to have someone at the store walk them through the installation and setup process. With external live cameras on hand, agents are able to show the product to online customers and demonstrate how it operates over live video. In reverse, the customer can choose to use their own camera to show a broken product or trouble-shoot with the agent. These engagements eliminate the need to go into a physical store – an online appointment with a technician from the comfort of their couch is much more convenient for the customer. Due to these video engagement sessions, businesses see a 3x increase in repeat customers. Technology continues to innovate and advance to create efficiencies in our lives. Although we’re quick to adopt these new developments, they sometimes create new issues that require humans to support us to fully realize their potential. Technology like Vee24’s Live Engagement platform combines personalization with efficiency and enables businesses to continue to connect and nurture relationships with their customers in the digital age.